The security system alarm activates when the doors, tailgate, or hood are opened without the key, or remote transmitter. 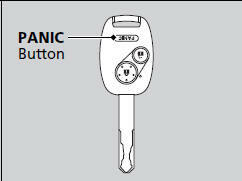 Unlock the vehicle using the key, or remote transmitter. The system, along with the horn and flashing lights, is deactivated. • The ignition switch is in LOCK (0, and the key has been removed from the ignition switch. • The hood is closed. • All doors and the tailgate are locked with the key or the remote transmitter. The security system alarm is canceled when the vehicle is unlocked using the key or remote transmitter. The security system alarm indicator goes off at the same time. If this occurs, deactivate the security system alarm by unlocking a door using the key or remote transmitter. Press any button on the remote transmitter, or turn the ignition switch to ON .